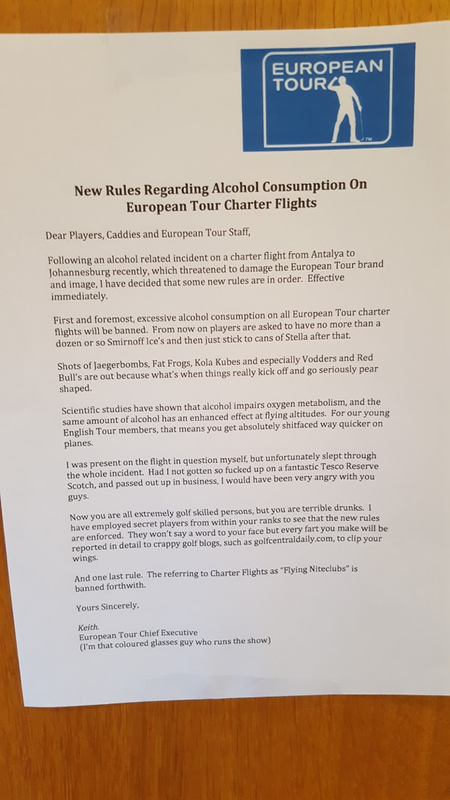 The European Tour has issued a letter to players caddies and staff outlining strict new rules regarding player alcohol consumption following a recent drink related incident on a charter flight from Turkey to South Africa. 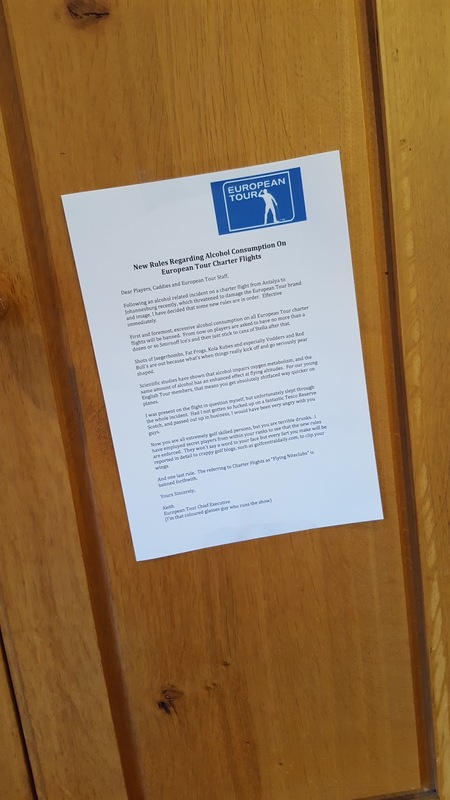 The letter was posted throughout the player's locker room at this week's Nedbank Golf Challenge. The letter spelling out the new alcohol rules post on a locker at the Gary Player Country Club. A player photographed the letter and sent it in. Close up of the new alcohol rules post on a locker at the Gary Player Country Club. Following an alcohol related incident on a charter flight from Antalya to Johannesburg recently, which threatened to damage the European Tour brand and image, I have decided that some new rules are in order. Effective immediately. First and foremost, excessive alcohol consumption on all European Tour charter flights will be banned. From now on players are asked to have no more than a dozen or so Smirnoff Ice’s and then just stick to cans of Stella after that. Shots of Jaegerbombs, Fat Frogs, Kola Kubes and especially Vodders and Red Bull’s are out because that’s when things really kick off and go seriously pear shaped. Scientific studies have shown that alcohol impairs oxygen metabolism, and the same amount of alcohol has an enhanced effect at flying altitudes. For our young English Tour members, that means you get absolutely shitfaced way quicker on planes. I was present on the flight in question myself, but unfortunately slept through the whole incident. Had I not gotten so fucked up on a fantastic Tesco Reserve Scotch, and passed out up in business, I would have been very angry with you guys. Now you are all extremely golf skilled persons, but you are terrible drunks. I have employed secret players from within your ranks to see that the new rules are enforced. They won’t say a word to your face but every fart you make will be reported in detail to crappy golf blogs, such as golfcentraldaily.com, to clip your wings. And one last rule. The referring to Charter Flights as “Flying Niteclubs” is banned forthwith.